To celebrate Madeline's 17th birthday we decided on a pink and green theme and just went from there. Invitations were made using card stock cut into the shape of a tag. I got the idea of using different fonts from invitations I've seen on Pinterest. Madeline chose 10 of her favorite quotes and we put them in inexpensive and a few re-purposed frames. I wrapped them in gingham fabric from Walmart and they played the game of exchanging much like the rules of an ornament exchange. I found the rules here. Madeline insisted no candles, no singing happy birthday...so we went with flags made from Lilly Pulitzer gift wrap. Thank you dear Elizabeth for finding LP paper! Shirley Temples and pink Lemonade. Photo by Bailey. Twistbands, garden roses and miniature latte bowls from Anthropologie, frames wrapped in gingham fabric and ribbon from Walmart. I generally wrap everything in Kraft paper, but I was imagining a lot of brown paper covering the table and decided a little piece of fabric would work well. 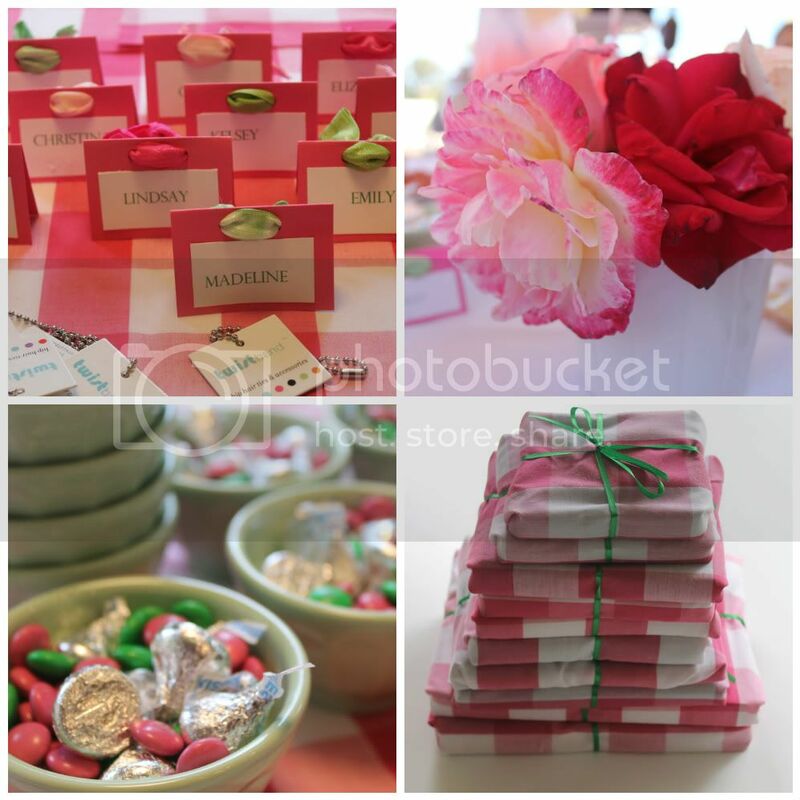 Details - The place cards incorporated pink and green twistbands that the girls all love to wear. I ordered pink stripe straws from Shop Sweet Lulu. They arrived looking like a little gift...love that. 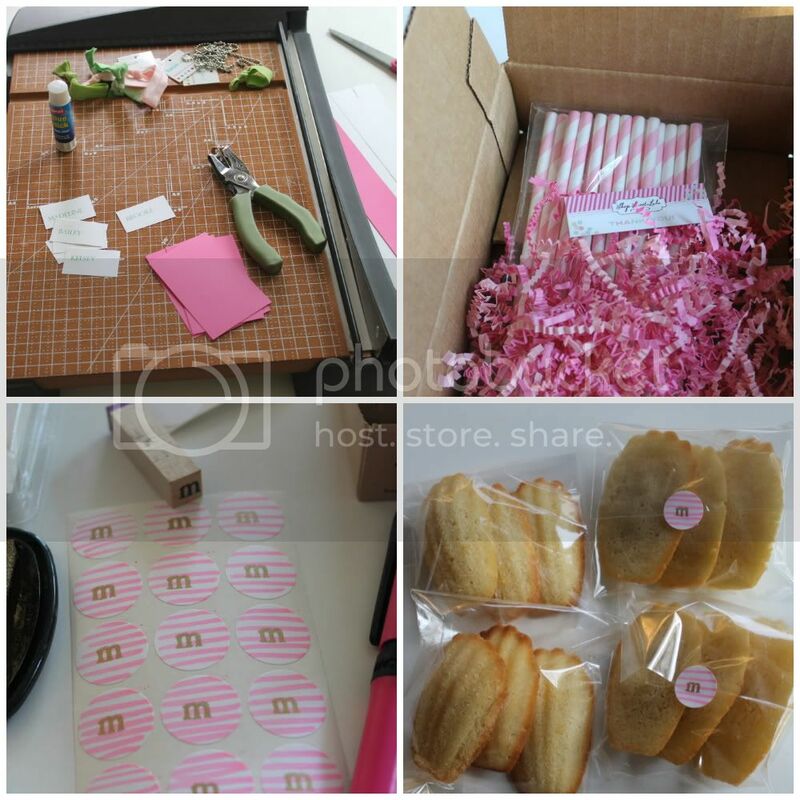 I made Madeleine's and put them in small cellophane bags sealed with an M sticker. I used this recipe and they were absolutely delicious! Brown bags for each girl to take all of her goodies home. Oh my goodness, SO cute! I'm kind of dying over that fabric and the fact that it came from Walmart. Annie, this is all so beautiful, you are so incredibly talented, I wish I could do this sort of thing. Okay so this was the most perfect party ever! When I turn seventeen will you do one like this for me? Happy Birthday Madeline! What a sassy party:) love all the details. Happy Birthday to your daughter!! Everything looks gorgeous, the pink and green theme is so pretty. i'm with jane. everything was gorgeous! love it all. hi madeline and happy, happy birthday!!!! This was all so adorable! How beautiful and perfect! This looks like the most beautiful, colorful and creative birthday party ever. I hope my daughter does not see this post (kidding, sort of... :) - yours is a hard act to follow!! Love it all Annie! Everything is so sweet and all the little details you put into this party are so fun! I love the idea of the frame game. AND that fabric, I made my daughter's bf a little skirt out of that fabric! Happy Birthday to your sweet daughter! What a special day for her and you too! What a lovely party! I'm sure the girls had the best time celebrating your daughter's big day. The framed quotes are perfect! You are so creative and every little detail is gorgeous. Your decorations and everything are amazing Annie, very nice. :) I'm sure Madeline had a wonderful birthday. what such lovely little details, the invitations are my favourite and the little goodie bags for everyone! I love that you made madeleines for Madeline's party! What a beautiful party - love the gingham and all of her favorite quotes - what a cute idea! Those cupcakes look crazy good. Happy Birthday Madeline! What a sweet party. All of the decorations are so pretty, and the attention to detail impeccable. Happy Birthday to Madeline! The decorations are so beautiful, I love all the pretty details! Madeline is a lucky girl! Happy Birthday to Madeline!!! Love all the sweet party details...especially the packaged Madelines! I love everything about your daughter's party! Those frames are so fun...love the "embrace messy hair" quote. oh how rude, happy birthday to m.